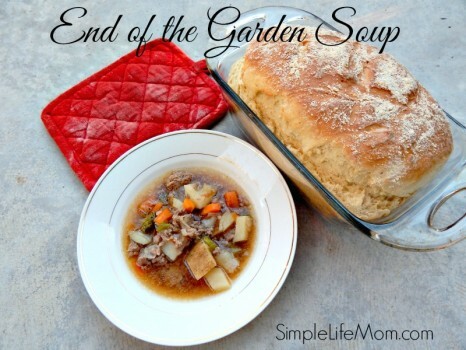 This End of the Garden Soup Recipe is a lot like what my mom used to call “Left-Over Soup”, because you basically take what you have in the refrigerator, add a few things from the cupboard, and there you go: an amazing, healthy, and delicious soup filled with delicious food that might have gone to waste otherwise. Actually, my mom is the best person I know to be able to pull something together for surprise guests. When we lived in Zimbabwe, there were those surprises almost daily. At least, it seemed that way to me growing up. And those surprise guests …there could be 10 or even 20 of them at a time. Imagine having to deal with that on a regular basis. Well, God prepared her for it. She wouldn’t even sweat it. She’d go put on some tea and get a giant pot out and start throwing things in. You gotta admit, as long as you have a great loaf of bread and a good soup, you have a great meal! This year, I sadly noticed that my garden was about done with most of the crops. Well, I shouldn’t say sadly. Harvest time is a time of rejoicing. I just wish everything didn’t have to start dying, but such is life. Anything that hadn’t already been processed into jars and the freezer was left out to make this amazing soup. Most of all you need the base: an AWESOME Homemade Beef Broth! Learn How to make your own Here. This is super important to have canned or in your freezer so you can grab some out for just such days as these. It’s also good in Homemade Pasta e Fagioli. What’s left? Tomatoes? Peppers? Onions? Carrots? Celery? Potatoes? Throw it in! Be creative with what you have left from your garden and what you have in your fridge, whether that be rice, noodles, etc. I’ll show you what I did down below. It ended up being fabulous! The recipe for the bread in this picture can be found HERE. A Super Healthy bone broth soup full of great vitamins and minerals. Brown beef and onion in a skillet, salt and pepper to taste. Add beef broth to a large stock pot. Soups with a bunch of random produce thrown in are always the best, haha! I can a End Of Season Soup every year just like your soup, it has garden vegetables. Your soup looks delicious and I know we would enjoy it. Thanks so much for sharing your awesome post with Full Plate Thursday and have a great weekend! Thank you Miz Helen 🙂 I’m sure your soup is wonderful. Thanks for stopping by! 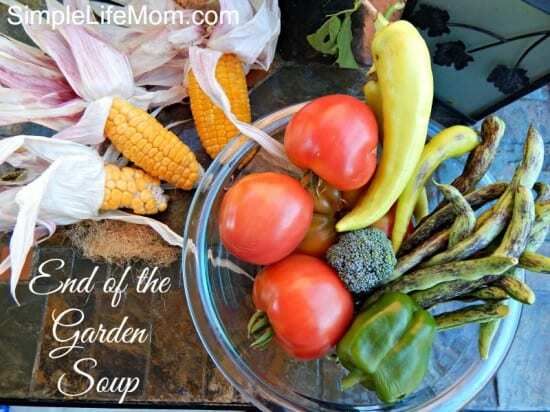 Sadly it is the time of the year that the garden fresh vegetables are about gone. This sounds like such a healthy tasty soup that would be great for a cool Fall day. Thanks for sharing on Real Food Fridays. Twitted & pinned. Thank you so much Candy! I’ll be looking for it. How fun, what a great recipe for a lot of vegi’s. Thanks for your submission to the HomeAcre hop. Feel free to stop by Pint Size Farm or one of the other hosts to submit another this week!